Dye transfer occurs when a colored dye bleeds onto another piece of fabric. This usually happens when garments of contrasting colors, such as white socks and a red T-shirt, are laundered together. However, it can also occur when a wet garment comes in contact with another fabric for an extended period of time. If you accidentally tossed a pair of freshly washed blue jeans onto your leather couch, chances are you'll have a splotch of dye to remove. 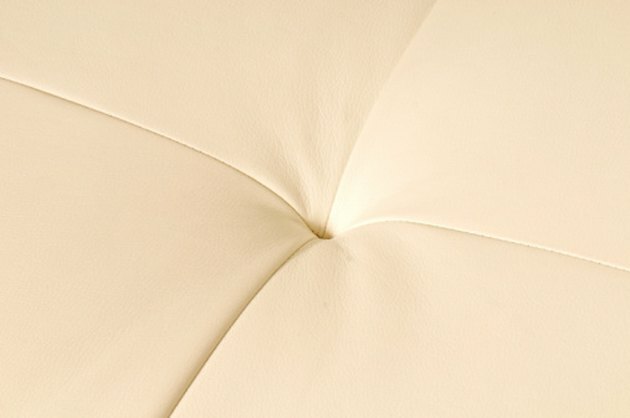 Dye transfer can ruin the clean look of a white leather couch. Make a mixture of two cups warm water, one tablespoon liquid dish soap and one tablespoon white vinegar. Saturate a clean sponge with the mixture and blot the entire dye stain with it. Let the mixture permeate the stain for five minutes. Wet the sponge once more and re-blot until the stain disappears. Wet a soft cloth with cool water and wipe the leather clean. Dry the leather completely with a soft cloth. Treat the area with a leather conditioner if desired.